It would help us if you pre-complete your application form. If you are under 18 years you must get your parent or carer to complete this form and also this second one which is required under our Child Protection Policies. Short term visitors to the UK can not be covered. Finding a club is really easy use our link to Where to Find us which takes you to a page of maps showing the location of our Clubs once you have decided on your nearest click the location name and the link will take to the Club pages which will time where the club is and when it trains. There is a further map accessible to help you to get to the Club with ease. Contact details are given as well as well as some background to the Instructors in the Club. All our Instructors are qualified to coach through the Governing Body - British Aikido Board qualification scheme. If you have any specific queries - email the Club or ring the contact number before going. These details are on the relevant Club page. As you get into Aikido you should get a Karate or Judo suit. Some of our Clubs will purchase these for you from Wholesalers at a lot less than the retail price in shops. Judo suits are typically thicker and withstand better throws where the suit is gripped and is the traditional choice. However some members prefer the thinner karate suit. The choice is yours. 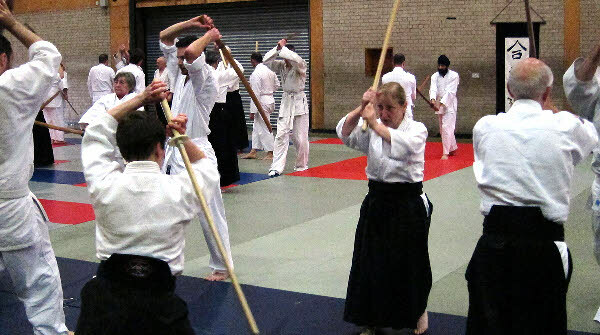 Weapons are needed to take your studies further as they serve to underpin the aikido and typically form part of an aikido class.